Steiner Optics 2444 10x42 Predator Model 2444 Binoculars FREE SHIPPING! 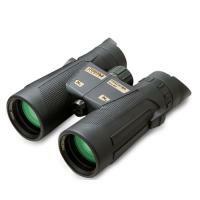 The 10x 42 Predator Binoculars by Steiner Optics (model no. 2444) are specially designed for hunters yet are versatile enough for both big-game and small-game hunters. Weighing only 26.5 oz. (1.66 lbs. ), these binoculars offer 10x magnification and 42-inch lenses with roof prisms and CAT (Color Adjusted Transmission) coatings so they work well in low-light conditions. It's also waterproof so that it can be fully submerged in as much as three feet of water without harm. This also has a neoprene, ClicLoc neck strap and comes with a carrying case. This comes with Steiner's Heritage-level warranty which is good for the life of the binoculars (US and Canada only). The warranty is, unlike most, transferable to new owners, so pass them on to your kids. Steiner will replace or repair the binocular at no charge for pretty much everything except misuse and theft. You simply need to register the binoculars via the company's web site. Field of View at 1,000 yds. : 328 ft.
Waterproof: Submersion to 3 ft.
©2002-2019 CopsPlus.com: Steiner Optics 2444 10x42 Predator Model 2444 Binoculars FREE SHIPPING!